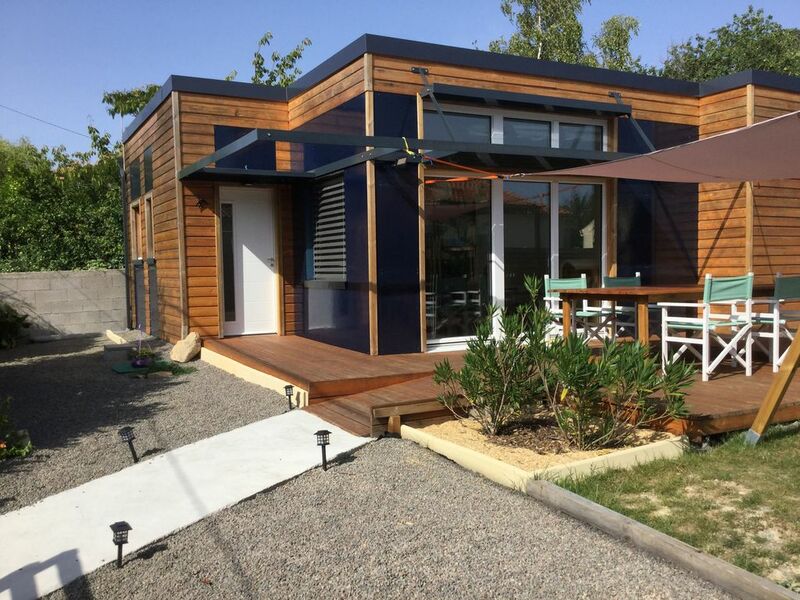 Ideally located: about 8 kms from the Dunes beach of Brétignolles sur Mer, about 15 kms from Les Sables d'Olonne, about 20 kms from St Gilles Croix de Vie. No constraints of parking, starting of walks or bicycle, close to the forest of Olonne and the salt marshes of the Island of Olonne and small shops nearby (supermarket open every day - bakery - beauty institute that offers fabulous massages - a hairdresser - a bazaar shop - emmaus (books, jewelery, games and toys ...). Obtaining our labeling by the tourist office in furnished 3 stars. We propose you a break at the lodging the Hirondelle (house "passive") for 6 people max. in the quiet of a dead end. Thanks to the performance of its thermal insulation and its ventilation, it maintains a soft ambient temperature throughout the year. Adjustable sunshades (BSO) for the west window of the living room and in the 3 bedrooms: one can have light without the sun coming in and without being seen from the garden. A remote control is used to manage their openings. - 2 themed bedrooms with a 140 * 190 and 140 * 200 bed with tilting windows + BSO and wardrobe / drawers + duvet and blanket for a better sleeping in summer and winter. - 1 room with 2 beds of 90cm in 1/2 overlay with storage and tilt-and-tilt window + BSO and wardrobe / drawers + duvet and blanket for better sleeping in summer and winter. Children's games available according to age. - 1 storeroom with washing machine + laundry basket, iron and small table, vacuum cleaner, set of brooms, clothes racks and storage shelves. Its garden area with its wooden terrace and its pergola will offer you good moments friendly, decorated with plants that will flourish around you! - clothesline is kept out of sight. * Cleaning: 60 € end of stay - invoiced according to the state of the places of exit. In all our stays, no one has to use the wifi. We took the decision to remove it. No internet connection, a gîte disconnected! In harmony with the environment by respecting the rules of life and spaces, in family or between friends with your pet, it is free - prohibited for categories 1 and 2), make the most of your holidays! 2 sinks, an Italian shower with a shower stool if needed, a chair, hooks, storage, a towel dryer, a blurred window, a hairdryer, 2 ceramic glasses, 1 soap dispenser, large mirror. In the airlock of the entrance there is a separate toilet and a cloakroom. We have provided an umbrella for the beach or picnic (it will remain the year), household products, sponge, brush ... and toilet paper so that when you arrive you do not have to run ! Nous avons passé quatre jours avec nos 2 petites filles dans ce logement de plein pied. Tout était prévu: les jeux, les lectures et espace clos. Les 3 chambres étaient fonctionnelles et la literie parfaite. La cuisine était très bien équipée. A proximité: la plage et une aire de jeux à Bretignolles. Nos bémols: une couverture 4G insuffisante et aléatoire dans le quartier; une maison passive qui aurait pu être trop fraîche si Patricia n'avait pas mis à disposition gracieusement 2 chauffages d'appoint en plus du seche-serviette électrique de la salle de bains. Patricia est une hote accueillante, ponctuelle et précise. Maison très propre. Tout est mis à disposition pour être comme à la maison. Merci encore d'avoir mis à disposition le matériel pour notre petite de 20 mois. Et d'avoir changer l'organisation de la chambre pour mettre un lit de bébé. Merci pour votre appréciation et au plaisir de vous recevoir. Discover history freely and become actors of the time you are going through. For two hours, or for the whole day, the innovative museography will awaken your senses and make you change your mind about museums. Multi-generational family-friendly leisure park: Ridge trail, discovery trail on the tablet, discovery trail in the forest, visits to the castle, "small" trails, inflatable games and skill games ... Whatever your age, you will find the adventure that suits you. From dinosaurs to the present, come and learn History by having fun! Dino's park: open from April to mid September.